There was something jarring and disjointed about the sight of an old man sitting beside an eight-lane highway selling liver sandwiches from his perch on a concrete planter – as if a character from a traditional Ottoman shadow puppet show had wandered onto the set of the film Bladerunner. But this is Istanbul, a city perpetually on the make, where commerce knows no boundaries and any public space presents an opportunity. Like a hustler in a Nelson Algren novel, Lütfi Usta said, “Everybody’s out for theirs and I’m going to get mine too,” as he passed a liver sandwich into the open car window of a taxi idling at the curb. We love this itinerant liver man and his sandwiches for many reasons, including his wisdom. Of all the wandering food vendors, the ciğerci has the niftiest gear. 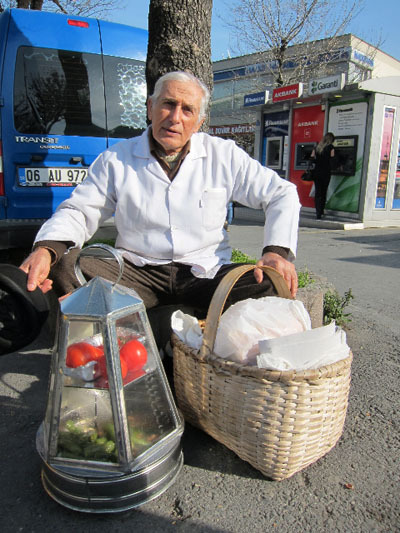 Lütfi Usta, a wandering ciğerci for more than 30 years, carries a large metal and glass lantern-shaped case that holds fried cubes of liver and grilled peppers in the bottom and whole tomatoes in an upper compartment. It is at once a cooler and an attractive, portable vitrine complete with foggy windows. But a man in this economy cannot survive on looks alone. Lütfi’s “Albanian-style” liver sandwich is a delightful midday snack. We took a seat next to him and ordered a çeyrek, or quarter loaf. He pulled a pre-cut five-inch fresh loaf of crusty white bread from the wicker basket and started loading it up with a generous spooning from each compartment of the liver case – first the liver, then the peppers and tomatoes and finally a dash of salt – before handing it over. The liver, bulked up with cubed potatoes and laced with onions, was warm and tasted less like the liver from some of our favorite grill spots and more like a hash. The liver’s batter barely gave way to a peppery oil bath it sat in, softening the loaf and the pepper and generally creating unity within the confines of the sandwich. We handed over the 3 TL for the sandwich and thanked Lütfi Usta, saying we’d see him again soon. “İnshallah,” he said. Apparently, not even the will of an Istanbul street hustler can challenge that of fate.